In the interest of full disclosure, I should note that before giving my thoughts on the 2019 Regal GS I recently experienced I should have it on record that at one time I wondered why GM was ditching the Oldsmobile, which it seemed to be getting right again, and not the stodgier Buick. I still had memories of how much fun the Pontiac LeMans my father had bought back in the early 1960s had been to drive. 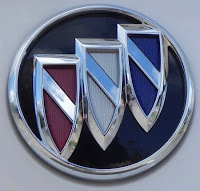 Buick, in my mind (and frankly many others) was for old people. 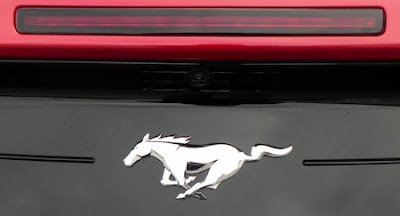 That ignores the economic reasons behind the decisions, of course, and probably is further evidenced why I am an auto writer and not auto executive. Pontiac had been unprofitable for several years. A team, many of whom were passionate about the brand, tried in vain to save Pontiac and make it profitable — but none of the scenarios proved viable. 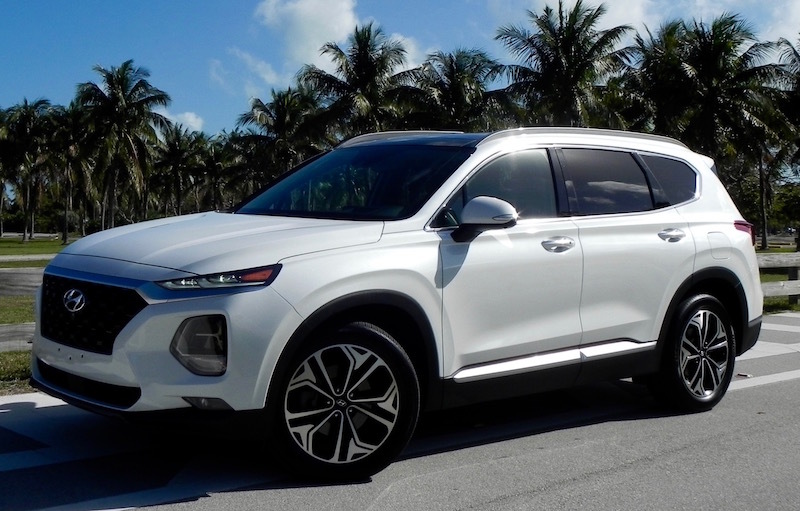 We kept Buick in the General Motors family because it is highly profitable and will grow with new models for the next few years, giving Buick an offering in several sedan and crossover segments. It could be argued that decisions by GM that sapped the quality of both Oldsmobile and Pontiac over a good many years put the two vehicles in their precarious position in the first place, but that is a subject for another debate. Today’s topic targets the Buick Regal GS sedan and what it has to offer. 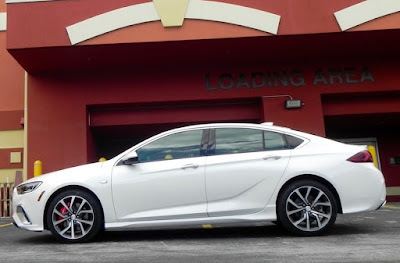 Or should I write Regal GS sedan from Buick since you won’t find the “Buick” named on any logos on the car itself, just the tri-shield logl in the front and “Regal GS” on the rear fascia. GM has removed “Buick” from the logos, and this has led speculation that GM may be looking to having Buick join Pontiac and Oldsmobile in automotive heaven — or hell, depending on your viewpoint. But as long as sales in China continue to boom that isn’t likely to happen. More than 80 percent of the company’s global sales are in China, including models not sold in the U.S. But I digress. 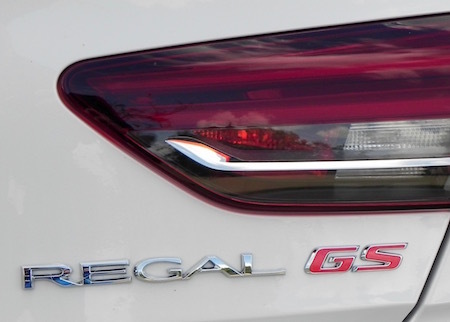 Let’s get back to the Regal GS. The Regal name dates back to 1973, though there was a production hiatus from 2004-2011. When it was brought back, it was seen as offering another way to help Buick shed its reputation of being an old person’s car. Even today the company’s advertising campaign still follows that theme. If you haven’t gotten the idea that the company wants you to quit thinking of Buick as something only for your grandfather you must be fast-forwarding through a lot of car commercials. 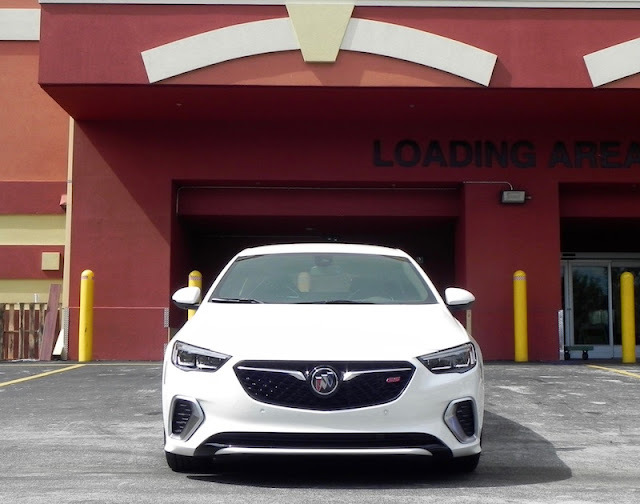 The Regal GS may not have a major role in this reclamation project, but it does play a part as what is labeled a “sports sedan,” which is a genre that more often than not appeals to a younger audience. It comes with a 3.6-liter V6 engine rated at 310 horsepower and 282 pound-feet of torque and mated to a 9-speed automatic transmission. US News & World Report ranks it No. 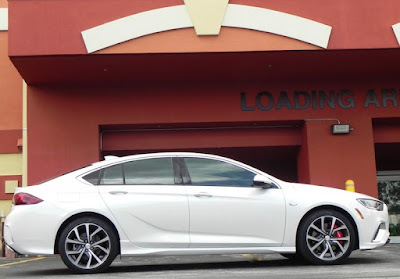 27 in a list of the fastest new cars for less than $50,000 (base price for the 2019 Regal is $39,070) with a zero-to-60 mph time of 5.4 seconds. 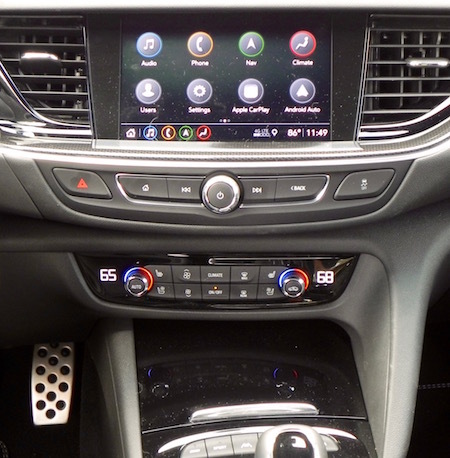 GS models (the Regal also is offered as a TourX wagon or Sportback hatchback) offer the capability of selecting driving modes to enhance performance. Sport mode stiffens the suspension, makes shifts more aggressive, and sends more torque to the rear wheels, and GS mode makes further adjustments for the sportiest performance. 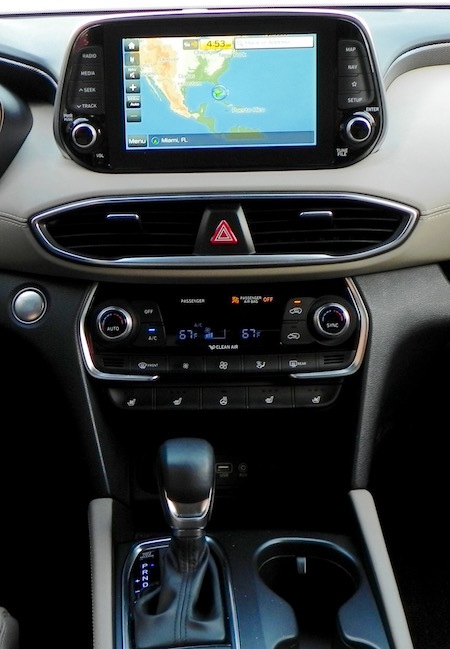 The Regal GS comes with all-wheel drive and features like lane-change warning and blind-spot alert, front and rear park assist, keyless start, dual zone climate control, heated front seats, tilt-and-telescoping steering wheel, 4G LET wi-fi hotspot capability, and lumbar support for both the driver and front passenger as standard. Throwing extras like a Sights and Sounds package that includes navigation, a premium audio system, forward collision alert, lane-keeping assist, forward pedestrian braking, LED headlamps, and a head-up display can run the total to just over $44,000. 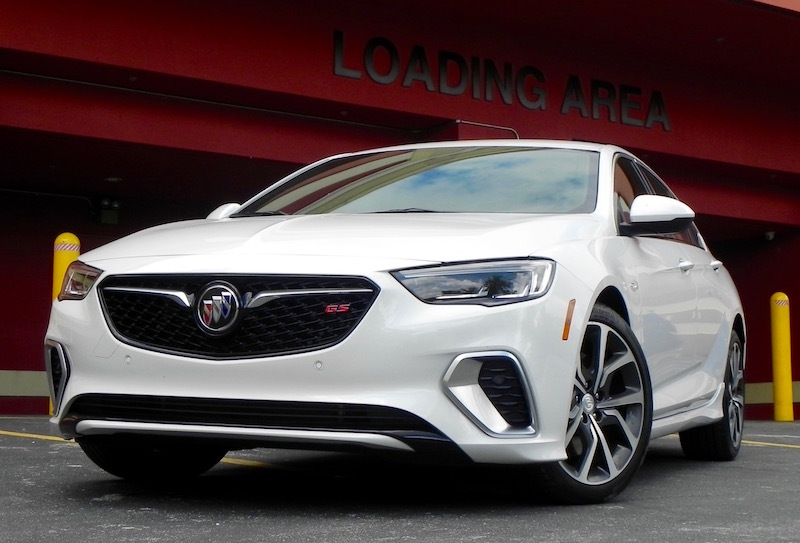 What I liked about the 2019 Buick Regal GS: The performance offers more than I expected, and the exterior has a nice look. 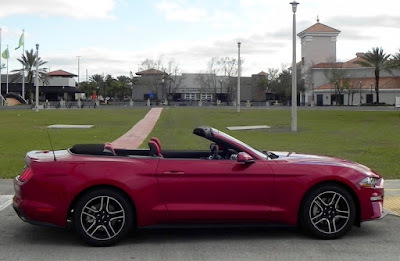 The so-called Driver Confidence Package is well worth the $1,690 it adds to the base MSRP with such features as adaptive cruise control, forward collision alert and forward automatic braking, front pedestrian warning, lane-keeping assist and alert, and a head-up display. 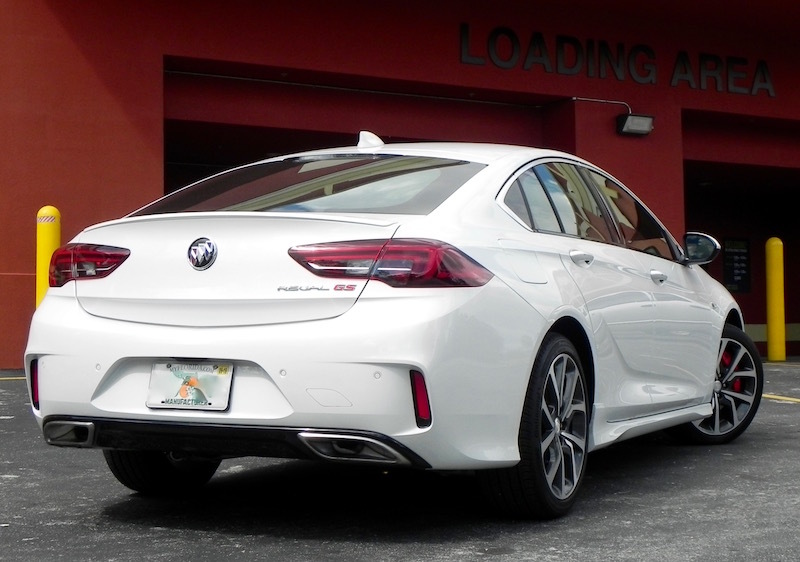 What I didn’t like about the 2019 Buick Regal GS: Fuel economy is a bit below average for its class, and while there is generous cargo space, rear-seat legroom is barely adequate (36.9 inches). 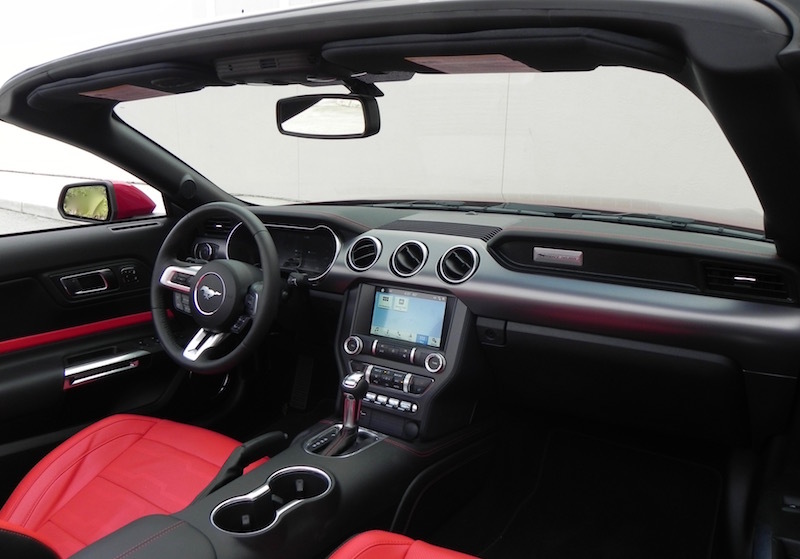 More attention to the detail on the interior, such as wood trim replacing the plastic touches, would help raise its stature. 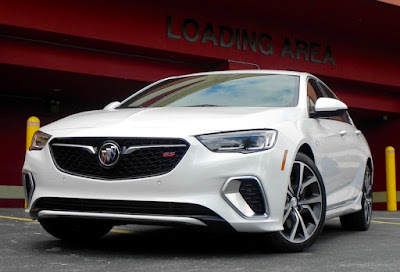 Would I buy the 2019 Buick Regal GS? Not sure. 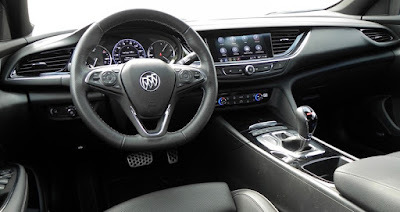 While there are many features I like about the Regal GS, there are a lot of other choices in the midsize class that can overwhelm it. 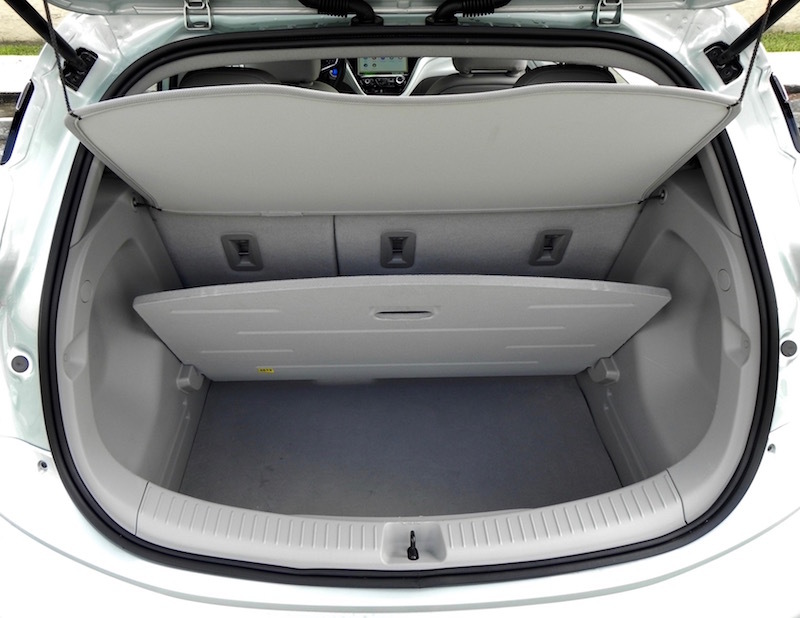 The Regal TourX wagon especially has more going for it when it comes to separating itself from the pack. 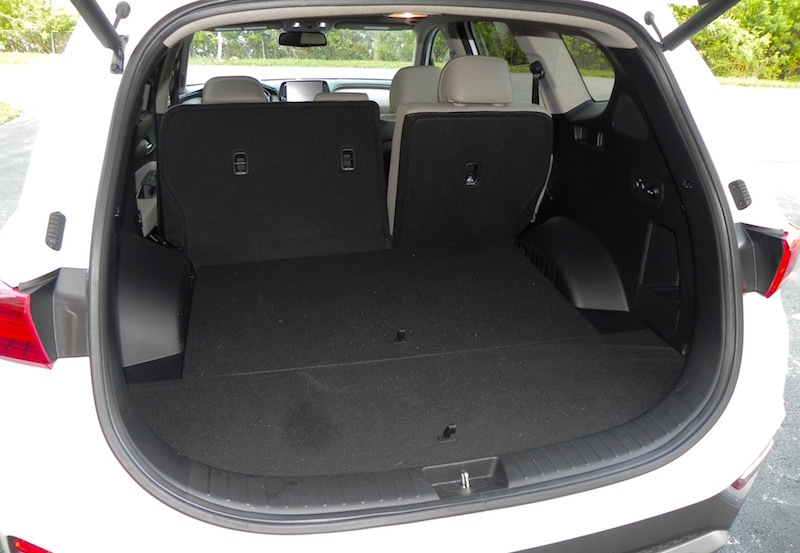 It also is available as a hatchback, but I’m not particularly fond of hatchbacks. 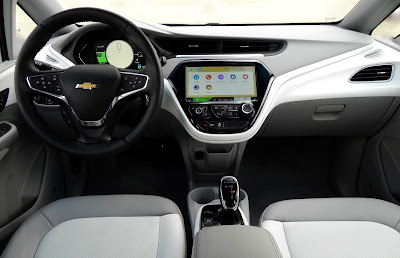 Though the electric car may be viewed by some as a recent development, its history dates back well over a century when, according to the U.S. Department of Energy, the work of innovators in the 1800s led to the first electric vehicle on the road in the U.S. in 1890. By 1900, electric cars were a popular choice among budding automotive enthusiasts, more convenient than steam-powered vehicles and cleaner and easier to drive than the gasoline-powered versions. Of course, we all know what happened. Steam cars died a natural death, and, thanks to the more economically feasible Ford Model T and a support system of filling stations throughout the country, gasoline-vehicles took over the market. Now, however, we see renewed interest in electric cars. 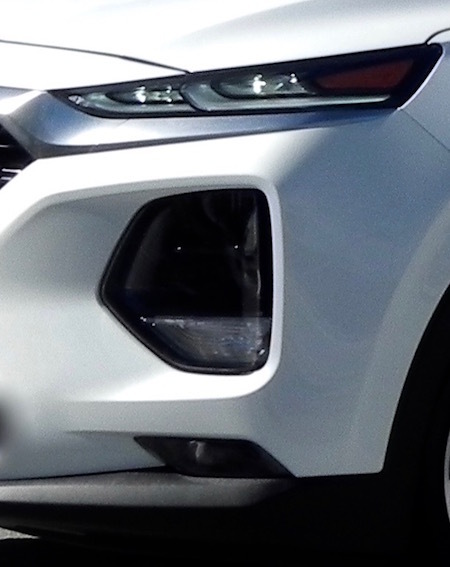 thanks in part to the introduction of hybrid gas-electric vehicles like Honda’s Insight and especially Toyota’s Prius in the 1990s and concerns about the environment and future supplies of fossil fuels. More recently, fully electric cars have come to market, but two issues may be slowing their development: their range (or lack thereof) and powering them up. Progress is being made on both fronts, but slowly. 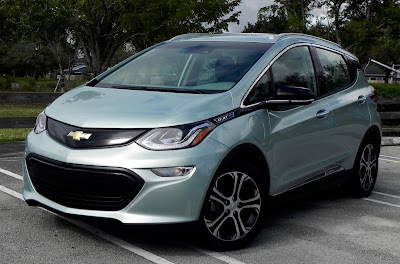 I recently spent a week in the 2019 Chevrolet Bolt EV, which unlike its stablemate the Chevy Volt, is an electric vehicle that the auto buff magazine Car & Driver rates the best “everyday” electric car on the market today. For C&D “everyday” apparently is code for “affordable” as compared to Tesla’s luxury models. 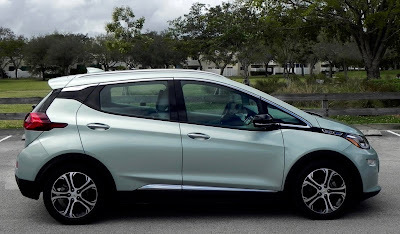 The Bolt EV comes in two versions with the base LT carrying a starting MSRP of $36,620 and the more upscale Premier edition starting at $40,904, so I don’t know if that really falls into the “affordable” class. This is especially so for a vehicle that lacks the refinement and niceties you usually find in vehicles in that price range. Standard equipment on the Bolt EV Premier model includes items like heated front seats, heated leather-wrapped steering wheel, and auto-dimming inside mirror in a Comfort and Convenience Package that is optional on the LT along with other features like keyless entry and push-button start and leather-appointed seats, but seat adjustments are made manually and cabin ambiance is more economy than premier. 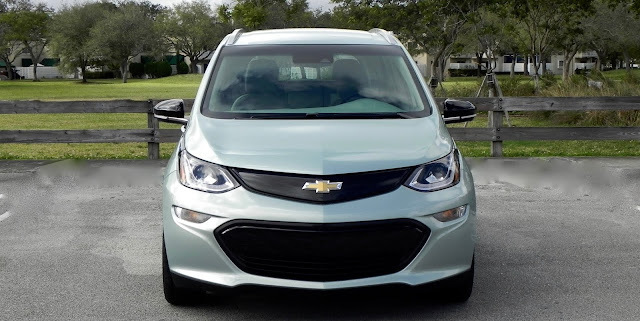 A Driver’s Convenience Package (automatic high beam headlights, Forward Collision Alert, Lane-keeping Assist with Lane Departure Warning, Front Pedestrian Braking with Pedestrian Alert), Infotainment Package (wireless charging, Bose Premium sound, USB charging ports), the DC Fast Charger, and the $875 destination and delivery charge) ran the total for my Bolt EV Premier to $43,510, which is getting up there for a non-luxury compact hatchback. Of course, being an electric vehicle, there are tax credits and other current (pun intended) incentives from the government to knock some off that price. 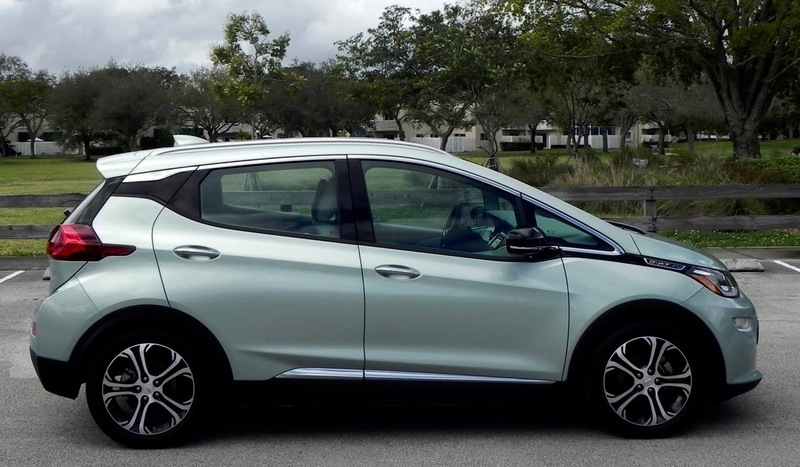 The Bolt currently (again pun intended) qualifies for up to the full $7,500 U.S. tax credit. The reason for the C&D’s recognition of the Bolt, however, doesn’t have so much to do with the MSRP as it does with the Bolt’s technology. Chevy boasts a range of 238 miles on a full charge, though that may vary. 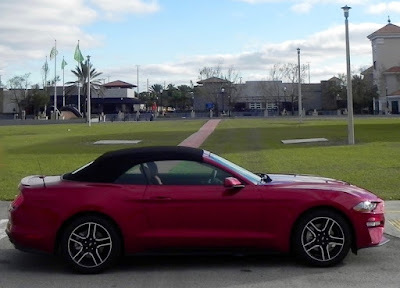 Once I got my test vehicle up it showed a range of 267 miles, but that wasn’t until I was able to leave it hooked up to my household outlet for an extended time (well over a day) that I was able to get it up to that number. That’s the rub that no doubt many overlook. If you are going to go with an electric vehicle, you really need to invest in a Level-2 charging (240 volts) system. Depending on where you work, you may be close to a charging outlet that will allow you to charge up your car during the day, and you can top it off when you get home at night. A DC fast charger also can give you a range of up to 90 miles in about half-an-hour. But what about those family vacation trips? You’ll have to rent a conventionally powered vehicle or be prepared to add time to your journey. Motor trend magazine reported that an 800-mile trip using a DC fast charger took nearly twice as long than doing a similar trip with a gas vehicle. Or maybe you’ll just fly to your destination. 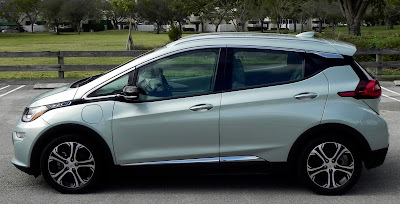 What I liked about the 2019 Chevy Bolt EV: The handling and throttle response is excellent. This can be a fun car to drive (it even has a Sport mode), one that is roomy and quiet as well. Zero-to-60 mph times of less than seven seconds have been reported. 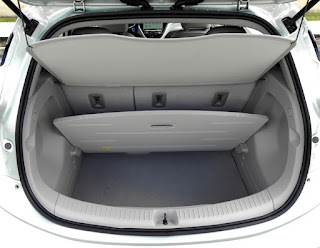 The false floor in the cargo areas gives you a place to hide items from view. 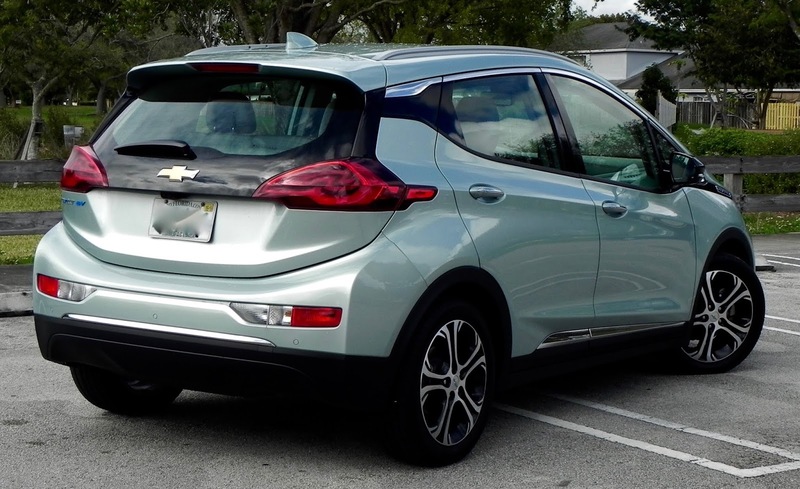 What I didn’t like about the 2019 Chevy Bolt EV: Without a 240-volt charger, charging times are long, and max range is difficult to get to. 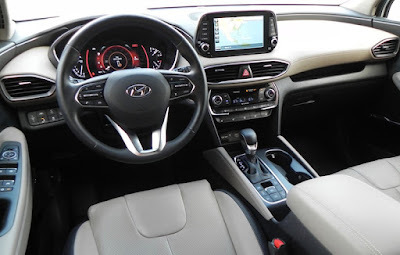 The interior has a cheap feel to it especially for its initial price. Built-in navigation isn’t available. 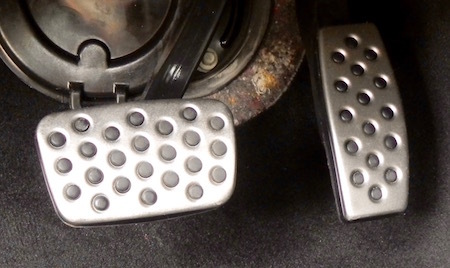 The gear shift pattern is unnecessarily complicated, and the car seems to have a mind of its own when it comes to locking the doors after you get out. Beep! Beep! Would I buy the 2019 Chevy Bolt EV? Not likely. 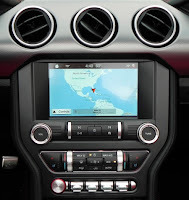 Range (I have mileage anxiety) and charging times (no patience) are issues with me. Spur-of-the-moment trips to the Keys? Forget them. 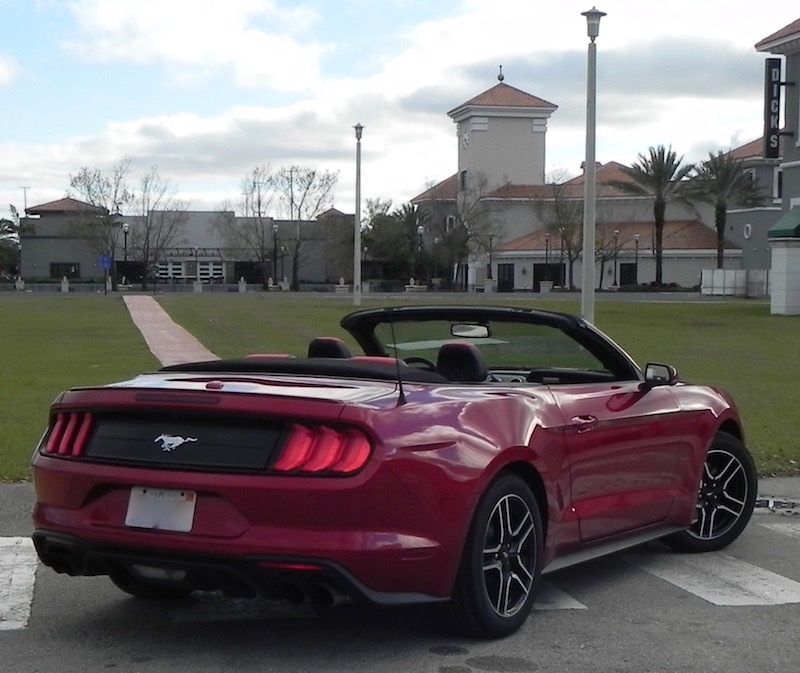 Even with the Fast Charger, longer excursions are impractical. 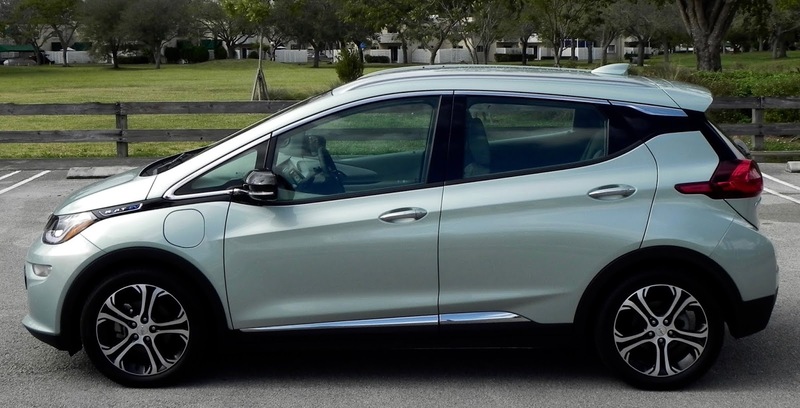 The Volt doesn’t have the electric range of the Volt (only 53 miles) but at least it has a gas engine to kick in, resulting in up to 1,100 miles driving between fill-ups with regular charging. 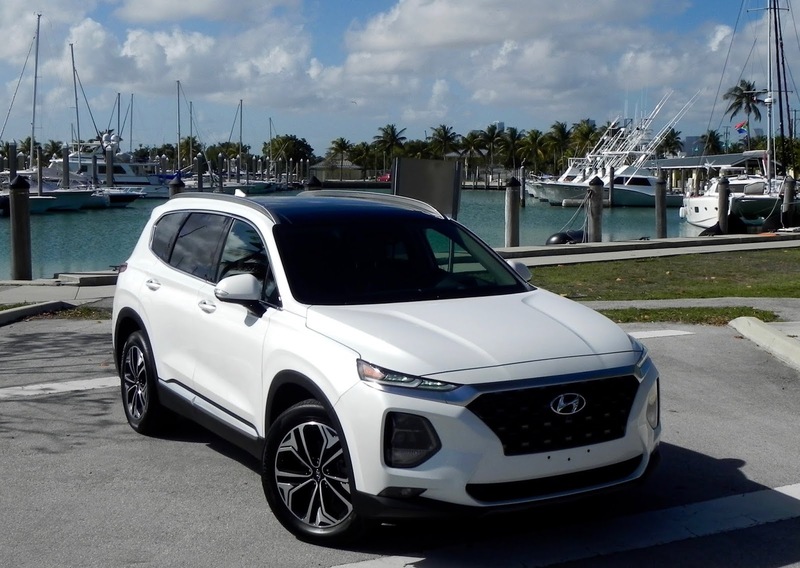 Crossovers and SUVs may be pushing aside sedans in the automotive world, but one traditional segment remains strong, and that is the pickup truck. 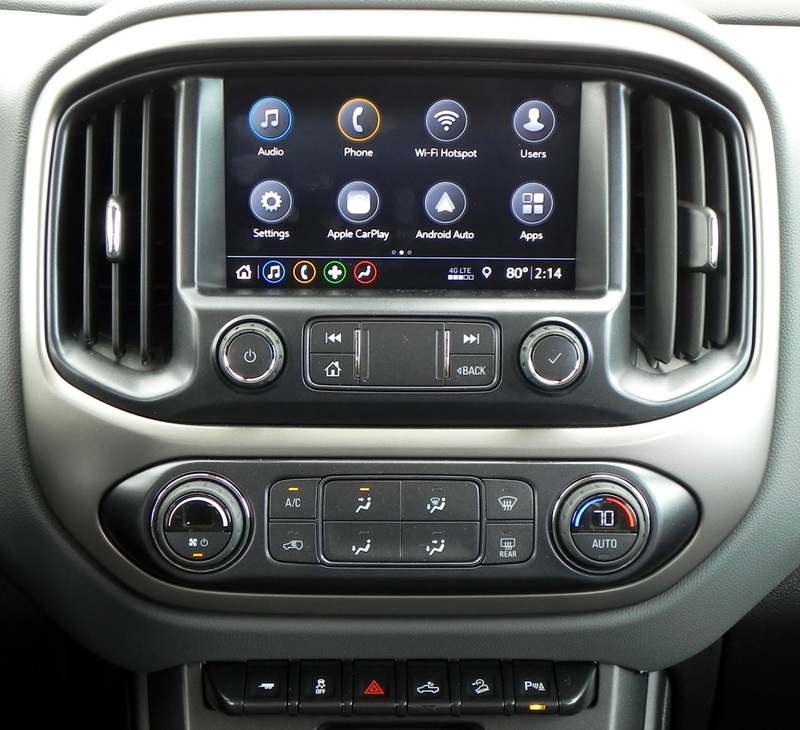 In fact, the top three selling vehicles in 2018 are pickups — in order, the Ford F-Series, the Chevrolet Silverado, and the Ram pickup. 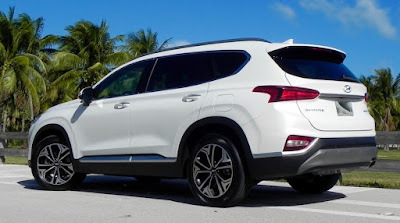 Sales numbers for these three were a combined, 2,033,492 last year, which is well over 800,000 more than the next three vehicles on the list, Toyota’s RAV4, Nissan’s Rogue, and Honda’s CR-V. Little wonder that some manufacturers are cutting back on their sedan production to concentrate on their SUVs and pickups. But as popular as they are, the traditional half-ton pickups (misnamed by today's capabilities) may be too much for someone who still might like a truck in their future. If you aren't going to carry a lot of cargo, you may find the disadvantages of the full-sized pickup offsetting. A full-size pickup can be a real bear to maneuver in tight mall parking lots, usually is thirstier than a smaller model, and often comes with a higher sticker price. They’re not as fun to drive either. But consider the midsize pickup. It can handle more modest hauling needs like runs to the local home improvement/garden center, generally is more fuel efficient, and is easier to get in and out of than its bigger brethren. And it still exudes more of “macho” image than your typical sedan. 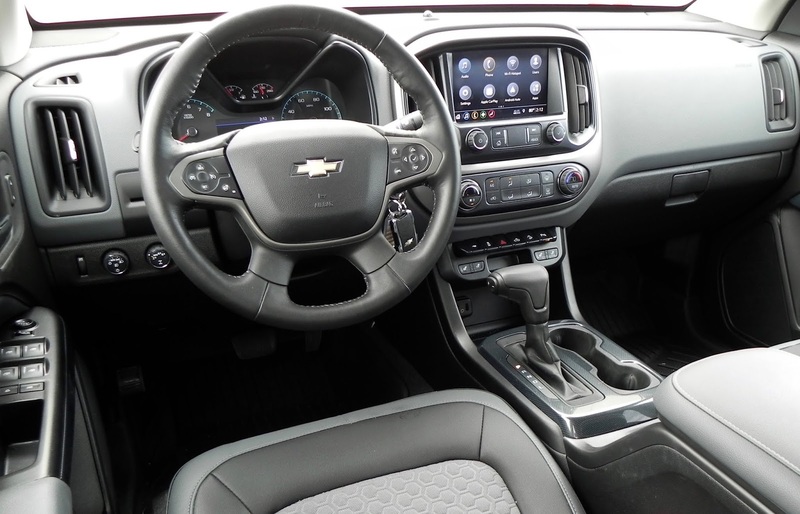 There are several good choices to be found in the midsize segment, one of them being Chevy’s Colorado. Introduced in 2004 along with its GMC counterpart, the Canyon, the Colorado is offered in a number of different cab/bed configurations in five trim levels starting with a bare-bones Base model and a slightly upgraded Work truck. 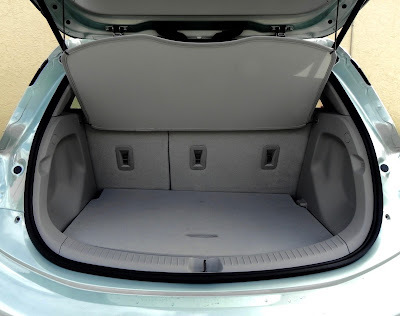 LT trim covers as standard what are options on the Work model, and the Z71 takes that another step by making standard features that are optional on the LT trim, like automatic A/C, rear-window defogger, remote vehicle start, driver’s seat lumbar control, 4-way power passenger seat, heated front seats, and the EZ lift tailgate. The Z71 also is more off-road capable than the lower trims, but if that’s what you’re looking for, you need to splurge for the top-of-the-food chain ZR2 trim. My test model was the Z71 trim with crew cab and a 3.6-liter V6 engine and 8-speed automatic transmission. A 2.5-liter 4-cylinder is standard, and a 2.8L Duramax Turbo-Diesel is also available. 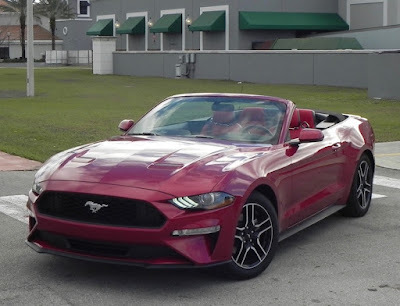 The V6 is rated at 308 horsepower at 6800 rpm and 275 pound-feet of torque at 4000, which is a good deal healthier than the 200 hp/191 lb.-ft. of the 4-banger, but the diesel (186 hp) boosts that torque up to a robust 369 lb.-ft. I found the performance of the V6 to be up to snuff. It certainly is no laggard. With its stiff suspension, the Colorado handles corners with little or no sway, and the ride on expressways is quiet enough. With the crew cab and the short box (5 feet, 2 inches), it is 212.7 inches long and a full 19 inches shorter than a Silverado Crew Cab, which makes driving it comparable to a midsize SUV. 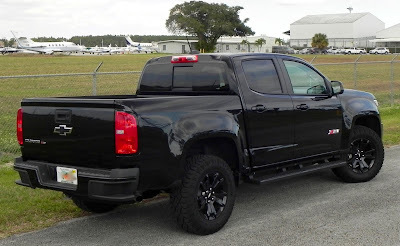 In addition to what was mentioned earlier, standard equipment includes the Z71 off-road suspension, fully automatic locking rear differential, hill descent control, an HD rear-vision camera, rear park assist, 17-inch dark argent wheels, front fog lamps, front recovery hooks, rugged all-terrain tires, folding rear bench seat, cruise control, tilt-and-telescoping steering wheel, leather-wrapped steering wheel, sport cloth/leatherette seats, and connectivity features like a 4G LTE Wi-Fi hotspot, all in the $36,900 base MSRP. Additional equipment included the Z71 Midnight Edition package (spray-on bedliner, body color grille, black bow-tie logos, dealer-installed all-weather floor liner, the Z71 emblem) and assist steps that ran the total to $41,565 including the $995 destination and delivery charge. 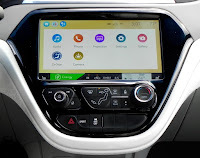 What I liked about the 2019 Chevy Colorado: It’s not too big to be a challenge to handle in mall parking lots, but big enough to handle most of the ordinary tasks non-construction workers might encounter. In other words, it’s just right. 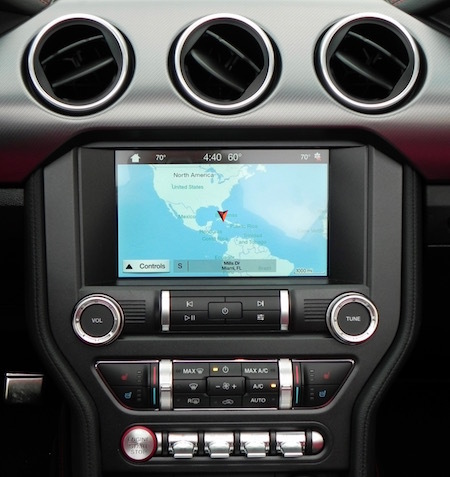 It’s a pretty good cruiser on the highway, and the infotainment system is intuitive to operate. The EZ Lift and Lower tailgate (standard on upper trims) is a nice feature. 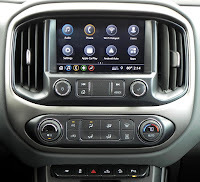 What I didn’t like about the 2019 Chevy Colorado: The running board makes it easier to get into, but seems at kind of an odd level. Legroom in the back of Crew Cab models is a modest 35.6 inches (but that is more than the 28.6 on Extended Cabs). 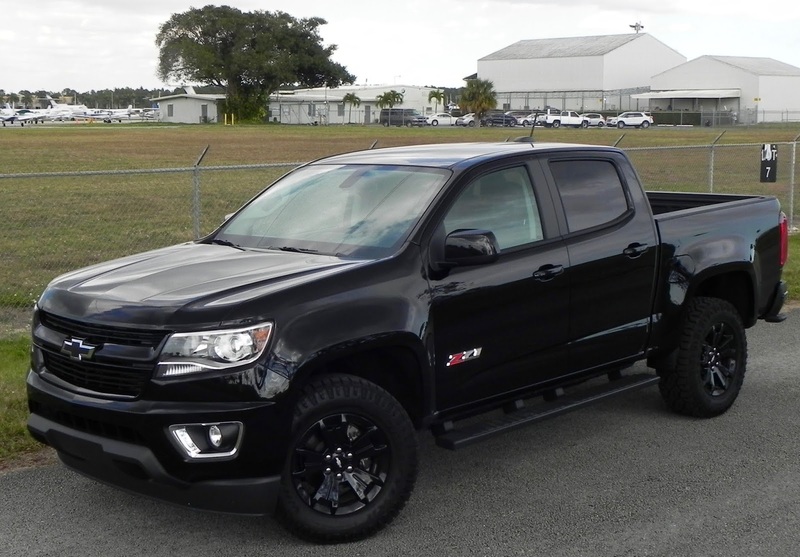 Would I buy the 2019 Chevy Colorado? There are other trucks I would look it if I were in the market, but the Colorado is definitely a contender. 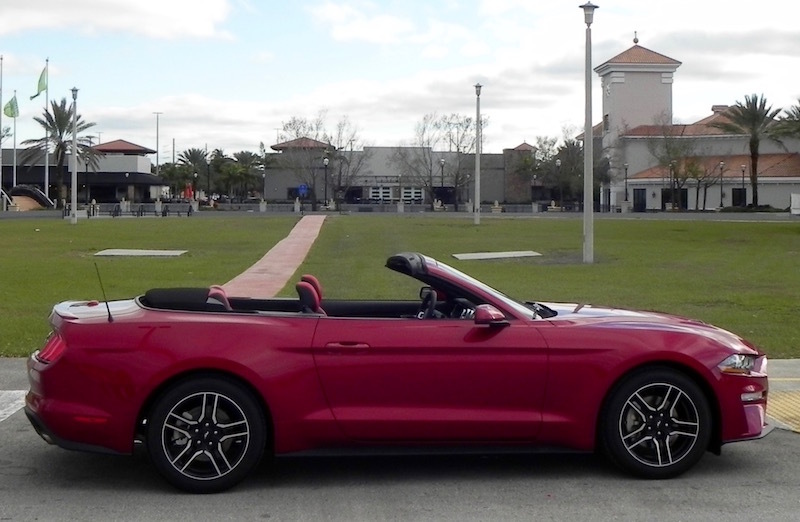 Ford's Mustang will soon reach “senior status” as its 55th birthday fast approaches, but it still is very much the same young-at-heart vehicle as when it was unveiled at the New York World’s Fair on April 17, 1964.